ON THE mean streets of New York’s Upper West Side, where rival gangs jostle for territory, and will fight dirty for it, where newly arrived immigrants compete among themselves - and against other ethnicities - to survive in a society hostile to them, two young people fall in love. Tony and Maria’s love is a romance in the eye of a hurricane. He is a member of The Jets, a gang of European immigrants who resent the presence of the newly arrived Sharks, a gang from Puerto Rico, led by Bernardo, the brother of Maria - star crossed lovers in a dangerous turf war. This is West Side Story, a reimagining of Shakespeare’s Romeo and Juliet by two of musical theatre’s heavyweights - composer/conductor Leonard Bernstein and lyricist Stephen Sondheim. First staged on Broadway in 1957, it will be performed by The Galway Patrician Musical Society in the Town Hall Theatre next month. As with any classic musical, West Side Story features songs that have taken on a life outside the show itself, and indeed they seldom come bigger than the exuberant ‘America’ - one of musical theatre’s greatest numbers. “That’s the one people are going to be waiting for,” says Declan. Those rivalries, and their underlying violence, explode in the dramatic ‘The Rumble’ scene where The Jets and The Sharks face each other in a vicious street battle. It is also a major turning point in West Side Story, and it will be a key scene for Declan, as Bernardo. “Bernardo is the leader of The Sharks,” says Declan. “His woman is Anita and she looks out for Maria, Bernardo’s younger sister. At Maria’s first dance at the gym, she meets Tony. That does not wash with Bernardo. The script says they have only arrived a month in New York and already they are being taunted and beaten up by The Jets. Eventually Bernardo organises a ‘rumble’. He thinks it will be an evenly matched fight, but he ends up having to take on someone twice his size - Biff, The Jets leader. So Bernardo produces a knife and through an intricate series of manoeuvres, there are two deaths and Tony becomes responsible for one of them. A more innocent side of the lives of the characters is captured in another of the show’s iconic songs - ‘I Feel Pretty’ which Maria sings after falling in love with Tony, unaware that dark forces have already conspired to doom their romance. 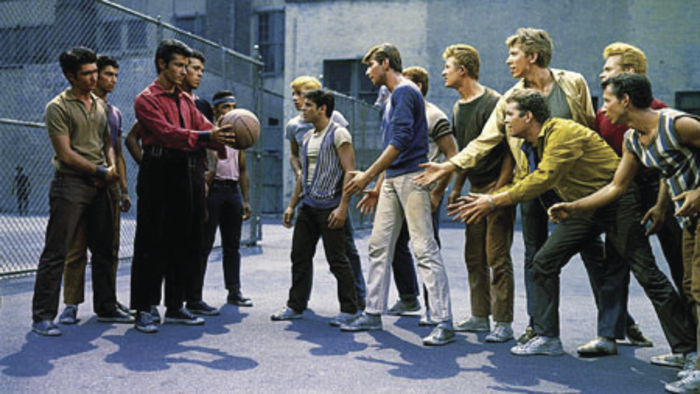 West Side Story was turned into a film in 1961 and went on to win 10 Oscars. Among its most celebrated features are the dance scenes choreographed by Jerome Robbins, which Declan admits have influenced his own choreography for the GPMS production.